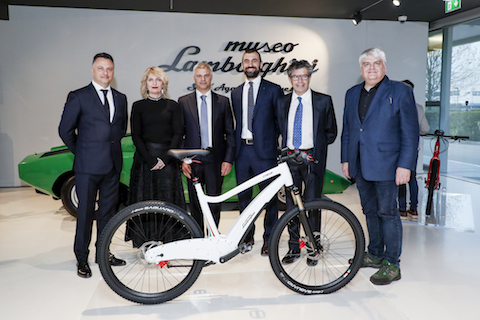 Automobili Lamborghini has signed a partnership with Italtechnology and presents the first range of E-Bikes bearing the Lamborghini name at its museum in Sant’Agata Bolognese. The E-Bikes by Italtechnology for Automobili Lamborghini are true masterpieces of advanced technology, aimed at an exclusive and demanding clientele. Conceived, designed, and built entirely in Italy, these E-Bikes are the result of over five years’ research and feature technological innovation, cutting-edge design, and four international patents. The new E-Bikes will initially be available in two versions: an MTB designed for a dynamic lifestyle and outdoor activities, and a version dedicated more to speed for customers who want ultimate performance on the road, with a bike that can quickly reach the maximum speed allowed by current regulations. The exclusiveness of the Italtechnology E-Bikes for Automobili Lamborghini is completed by the “Ad Personam” program, which customizes the livery in the paint colors reserved for Lamborghini’s super sports cars. The first two versions of pedal assist E-Bikes bearing the Lamborghini name will be available online and through selected specialized retailers worldwide starting in May.